Hi Everyone!!! I'm backkkkkkkkkk.. Sorry for being away for literally over a year. Make sure to follow my instagram pages (@SewUrbane and @YetundeSarumi) to see what I've been up to. My plan for 2018 is to make time to sew for myself AND BLOG like I used to.. at least once a month. 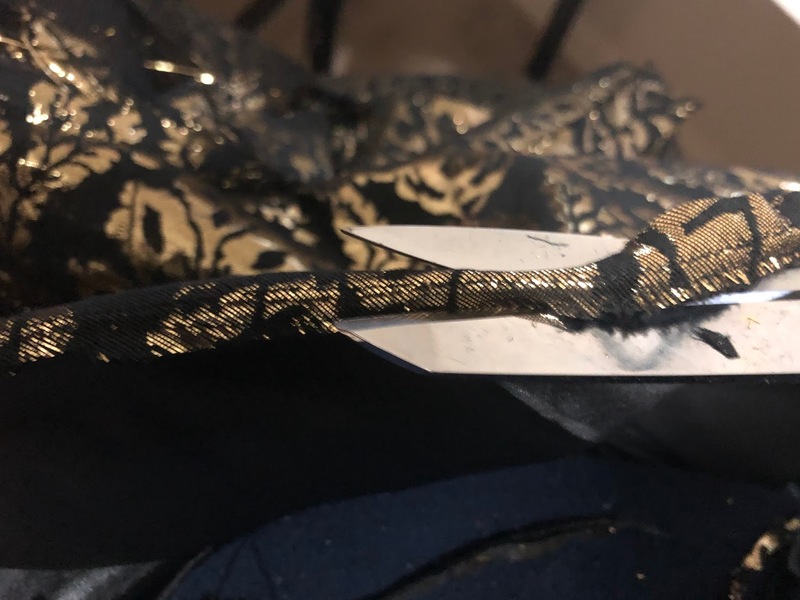 To be honest, every time I make time to sew for myself, I feel guilty and tell myself that I need to be using that time to work on my clothing brand, YS. There's always something going on with it. But this year it's going to be different... I'm challenging myself to do some Selfish Sewing for ME! Moving on to this FANCY number... I decided to start the New Year with something GLAM and Classy. The moment I laid my eyes on Vogue Pattern 1572, I knew I was going to make it and also which fabric to look for. I loved the square neckline, peplum, and wide leg pants. Did it look like the photo/drawing on the website once you were done sewing with it? Yes, I think so. Were the instructions easy to follow? Yes, until it was time to turn the lining for the top inside. The instruction suggested that you stitch the neck edges, armhole edges, and lower edges.. Do Not Stitch the Lower Edges! Instead, after you stitch the neck edges, armhole edges, Turn the lining inside, and THEN stitch the lower edges. I made that mistake and couldn't turn the lining inside, so I had to cut the stitches from the lower edges in order to fix it. So my top ended up being about half an inch shorter. What did you particularly like about the pattern? I love the simplicity of the design. Definitely my kind of style. And it was so comfortable to wear. Pattern alterations or any design changes you made: I didn't make any pattern alterations or changes except for having to cut the hem of the top, which made it about half an inch shorter. Would you sew it again? Yes, most definitely. Probably in another fancy jacquard fabric. Would you recommend it to others? Yes, no regrets. OMG it is so fancy!!! I love it! It turned out just perfect and the fit is ah-mazing. And of course it looks stunning on you. I also love that it is a two piece, meaning you can always wear the top with something else. And the same for the pants. Great make. I also checked out your clothing brand and it is gorgeous! So many gorgeous things and so much inspiration! Congratulations. Thank you so much, Anya!! Welcome back! What a lovely outfit. I'm a huge fan of anything with peplum. I didn't realize you had a clothing line. I'll have to check it out. Thank you!! 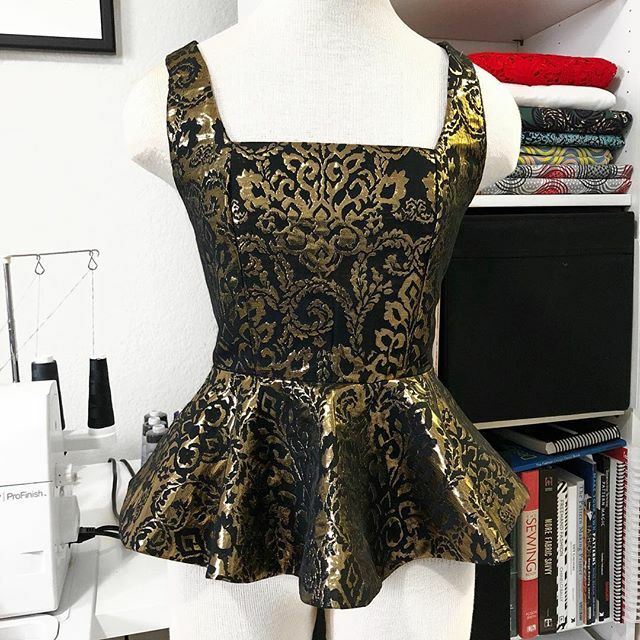 I love anything with peplum too.. They are very flattering. Ye', I am happy to see you're blogging and sewing for yourself again. You are amazing!! Missing your positive energy. Aww thank you, Vicki! It's good to be back.